We’re sure to see more of Oregon’s bipolar growth. Output will continue to show large jobs gains, while employment will remain weak. The output growth is driven not just by Intel, but by Oregon’s surging server-farm industry. Oregon now has five server farms over 200,000 square feet, and T5 announce about a week ago that it would be building a new 200,000 server facility in Hillsboro. Within the United States, Oregon is almost uniquely attractive as a location for server farms. Its climate, abundant energy, and tax structure combine to make Oregon almost perfect for server farms. While Hillsboro’s enterprise center has been center of many of the server farms (Adobe Systems, Digital Realty Trust, Fortune Data Centers, and now T5) major facilities are also located in The Dalles and Prineville. The construction of these facilities represents huge capital investments. Both during construction and once operating, these facilities generate output growth. However, after construction, they employ few people. 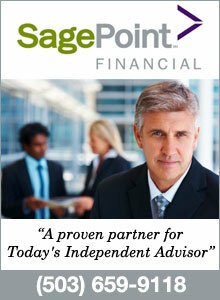 For example, T5 says that its new facility will employ “several dozen” people. This is a very small number of jobs for the investment or the output growth. 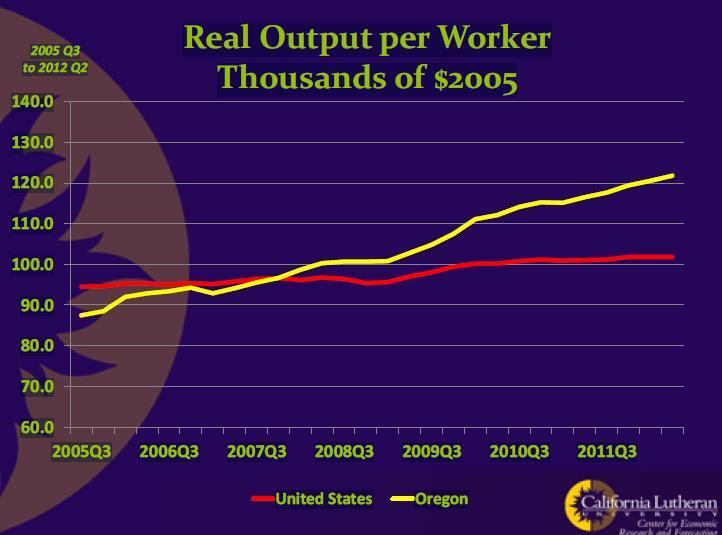 The growth in output per worker is not because Oregon’s workers have suddenly become more productive. It represents return to capital. I’ve been asked that since these server farms generate relatively few long-term jobs, are they good for the local economy? The answer is that they are absolutely good for the local economy. The new jobs are relatively good, and those workers contribute in many ways to the local economy. Given Oregon’s broad-based weaknesses on the job front, the State welcome any potential employer. If it were not for these server farms, Oregon’s economy would be even worse than it is, and it’s bad enough. Changing policy to discourage server farms, because they create few jobs, would be a mistake in my opinion. Instead, Oregon should be trying to leverage the server farms. These businesses are introducing Oregon to lots of people who have never seen the State. Odds are, these people will like Oregon, and many would like to live in Oregon. Try to give them a reason to make the move. They will bring new human capital and energy. At the same time, educational institutions should be working with Intel, the server farms, and other tech businesses to design programs to allow those companies to employ Oregonians. Already, Intel has expressed dismay how many of its Oregon workforce it has had to recruit from outside Oregon. This is particularly true for people with advanced degrees. It is true that Oregon’s server farms have created relatively few jobs. It is equally true that the server farms are not the cause of Oregon’s weak job market. Indeed, the farms create economic value and opportunity. Oregon should embrace that opportunity. The solution is to stop electing Democrats. You can’t keep expecting to make financial promises without real growth. Growth comes from business not government.